The Book Guardian: Oppa Gangnam Style! 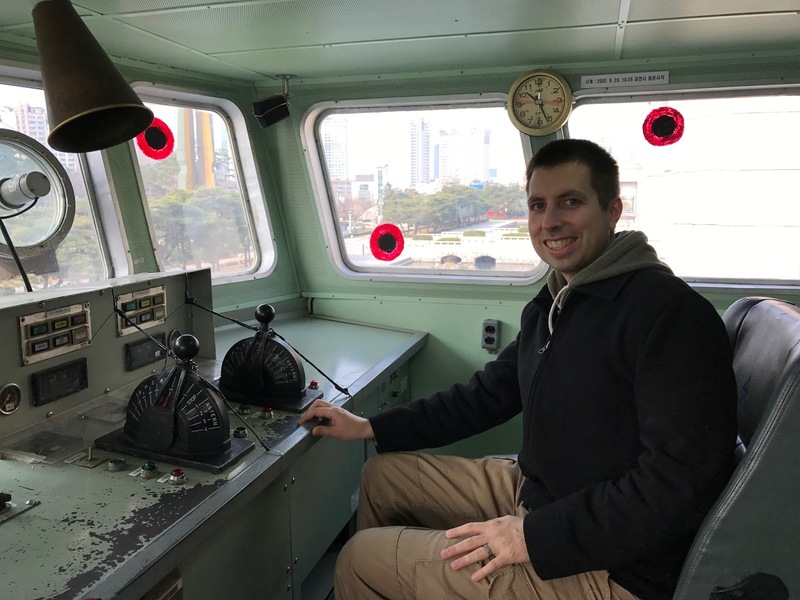 We are fortunate that Blake's current assignment is shore duty, which means he will be home most of the time, instead of sea duty, which means he would be assigned to a ship and gone a lot more. He may have sea duty in the future, and we'll make it work, but for now his trips away should be relatively minimal. However! 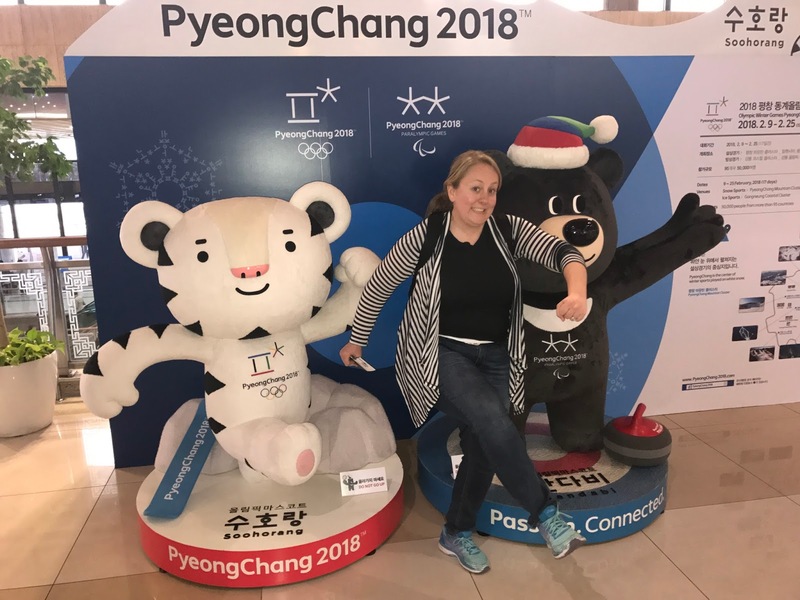 In March of this year, Blake received a temporary assignment in South Korea for a few weeks. We missed each other, but he really enjoyed the work and experience. Of course, one of the best things about some military assignments away from home are port calls - usually when a ship pulls into a foreign port and the sailor's family gets to meet them. In this case, I flew to Seoul, South Korea, with one of Blake's fellow JAGs (Caitlyn) to meet up with our husbands (hers is Jacob) who both had been on the temporary assignment. It was a super quick weekend, but still an incredible adventure! 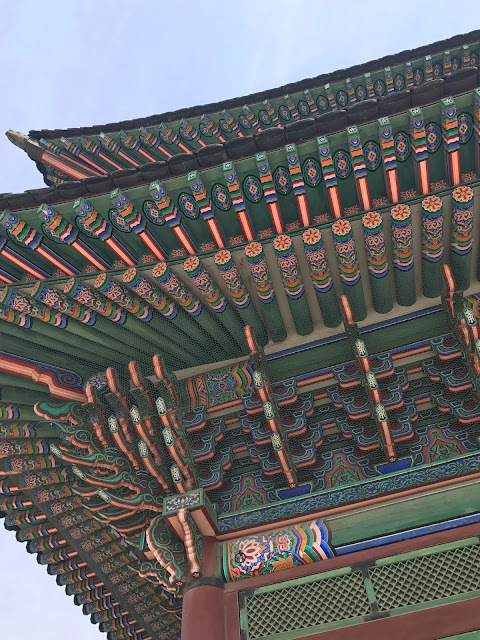 For the most part, travel to and around Seoul was quite simple - we mostly took cabs and walked. Caitlyn and I did have a bit of trouble getting from the airport to the hotel though. After struggling to find a way to get Korean won out to pay for the subway, and buying a train card we never ended up using, we decided to just take a cab. Our first cab driver was possibly a victim of some sort of extortion right in front of us and another older man was trying to chat us up, but also recording us in some manner. We eventually got out of the situation and found a different cab. The rest of the weekend was uneventful in the travel department, which we were quite relieved by. We stayed at the Dragon Hill Lodge, an American hotel on a military base, right in the heart of Seoul, and it was quite nice and familiar in a very unfamiliar city. Friday afternoon, we spent the time wandering the grounds of two palaces in Seoul - Gyeongbokgung and Changdeokgung. I'd told our cab driver to go to one of them, she took us to the other, but this happy accident gave us a chance to check out both! 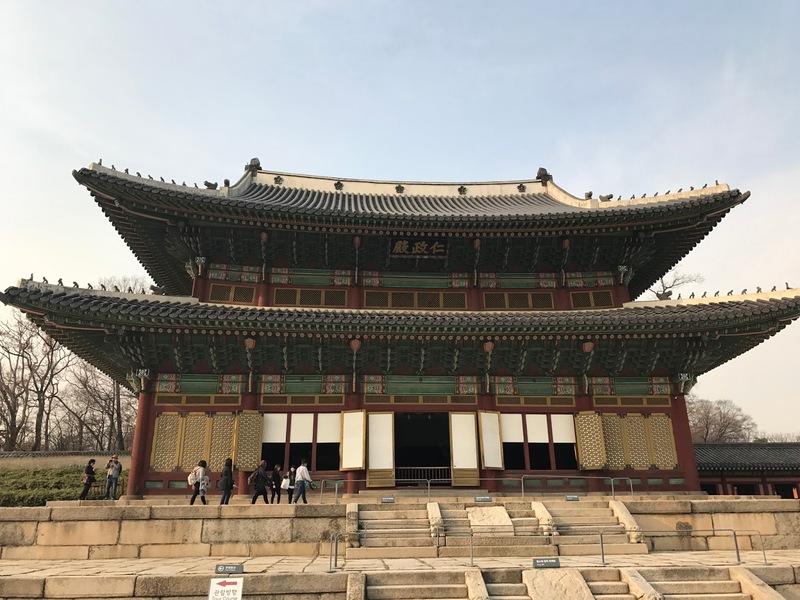 Changdeokgung was constructed in 1405! and is a UNESCO World Heritage site. All this painted wood was so beautiful! 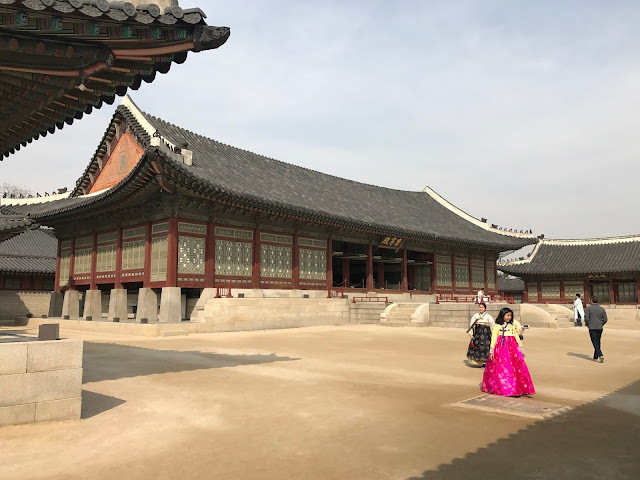 We found out too late that you can rent hanbok to wear around these palaces. So many lovely traditional clothes being worn by both men and women. If we ever visit again, I want to do this! 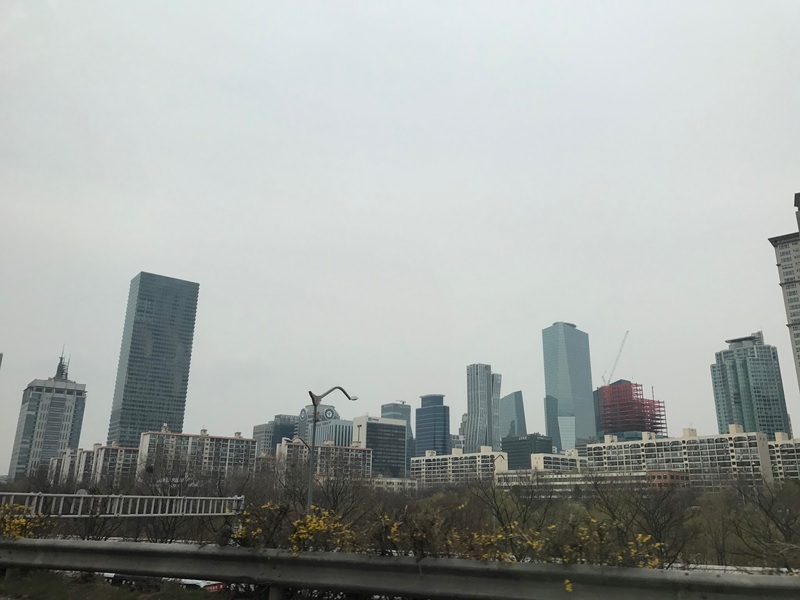 In the evening, I was hoping for a promising trip to a night market alongside the Han River, but we underestimated its popularity. 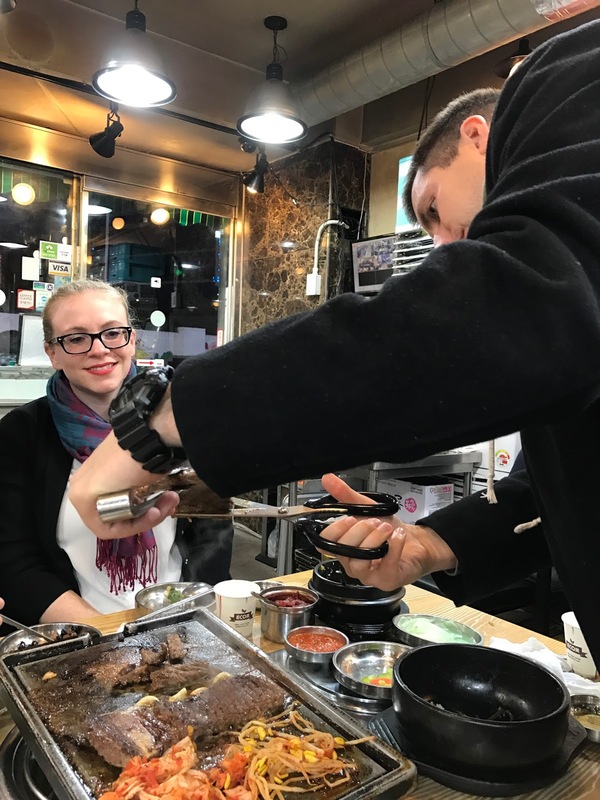 With LONG lines for food trucks and booths of goods we weren't particularly intrigued by, we ended up at a restaurant where we got to cook our own meal at our table. We probably did it wrong, but it was tasty! 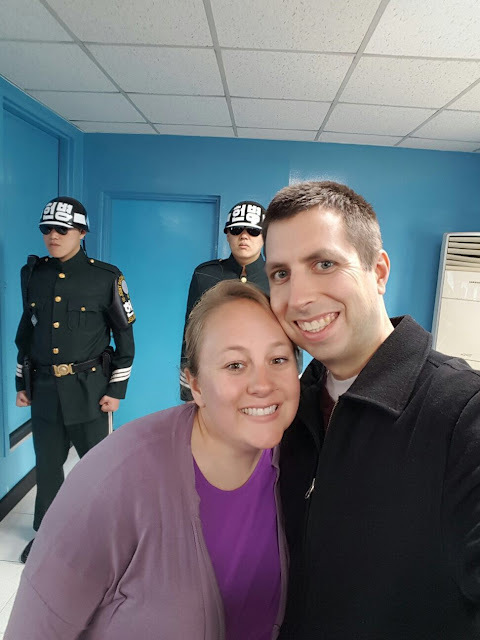 The biggest adventure of the trip was Saturday, which we spent touring the Demilitarized Zone (DMZ) and Joint Security Area (JSA) between South Korea and North Korea. We all learned quite a lot about the history of the region. And! 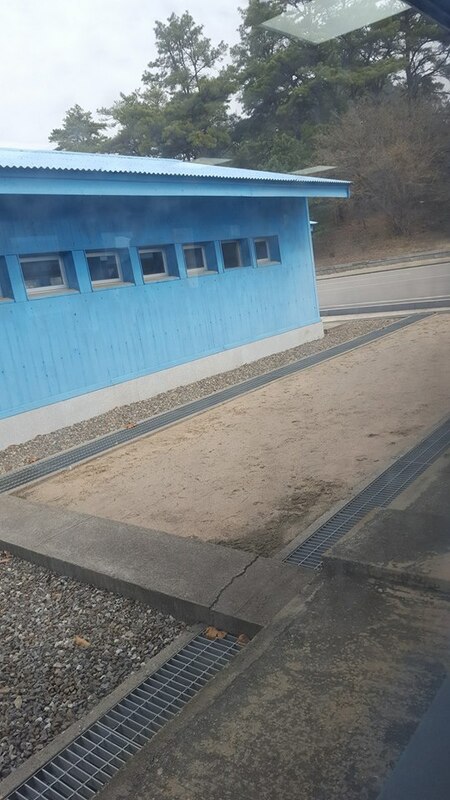 We crossed the border into North Korea for a few minutes. It is as far into North Korea as we will likely ever get, so even without a new stamp in our passports, we are definitely counting it on the list of countries we've been to. 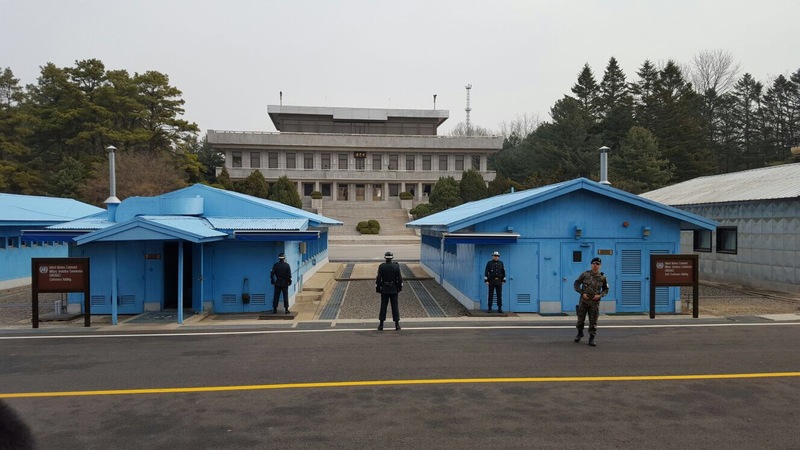 Line of demarcation - North Korea is on the right. Inside the room where the two sides meet occasionally. The microphones on the tables mark the border and we are solidly on the North Korean side. Those are South Korean guides behind us, so that there is always someone between the tourists and the North Koreans. Looking into the North Korean side. We were inside the blue building on the left in the previous photo. 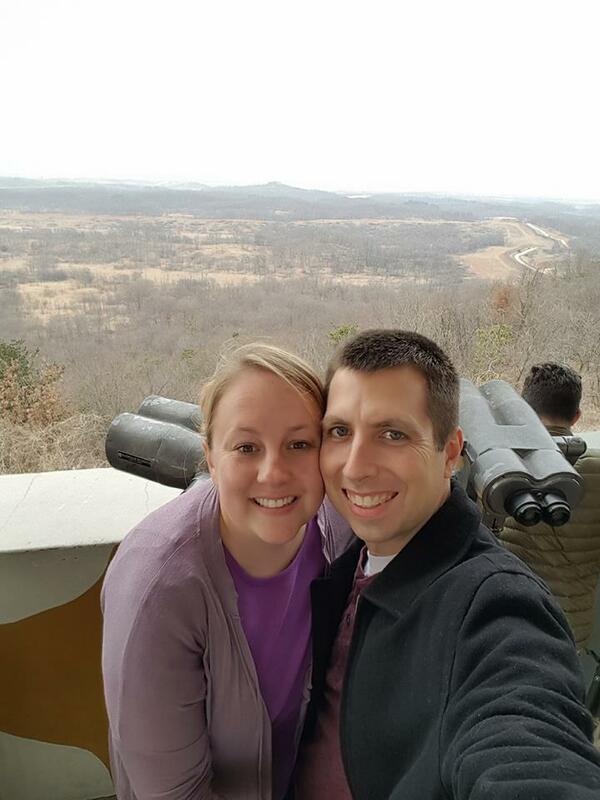 Our lunch break was in the sad, odd amusement park and shopping area of the DMZ. We had some seafood pizza and sausage for lunch. J-shaped ice cream cones? Why not! 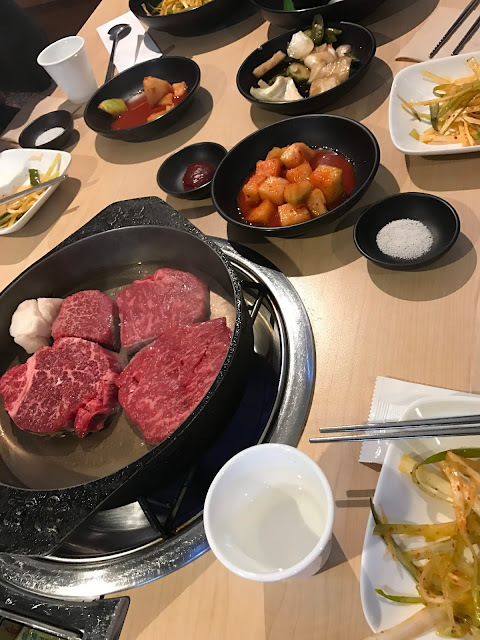 For dinner, we found ourselves at another Korean barbecue joint, but this was far less upscale and actually more fun. 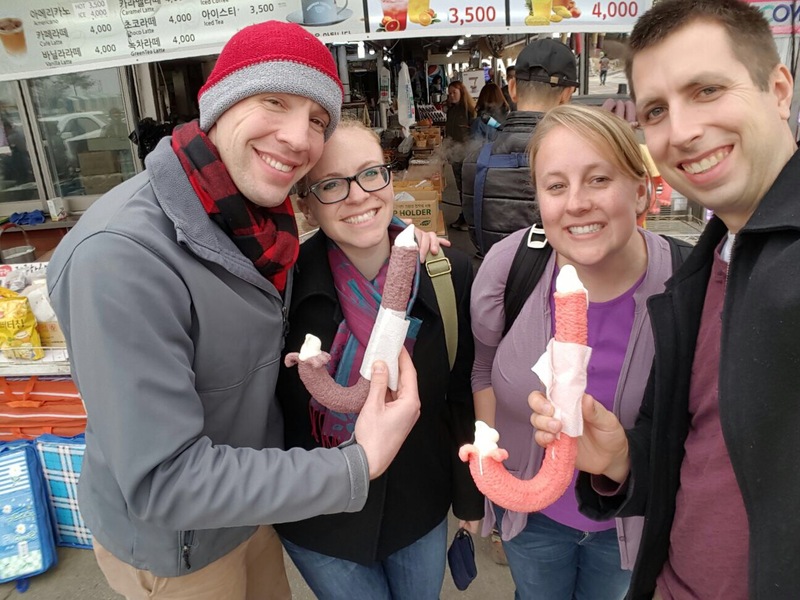 We tried a few different foods and had a blast, though not as much as the loudly drunk party next to us. 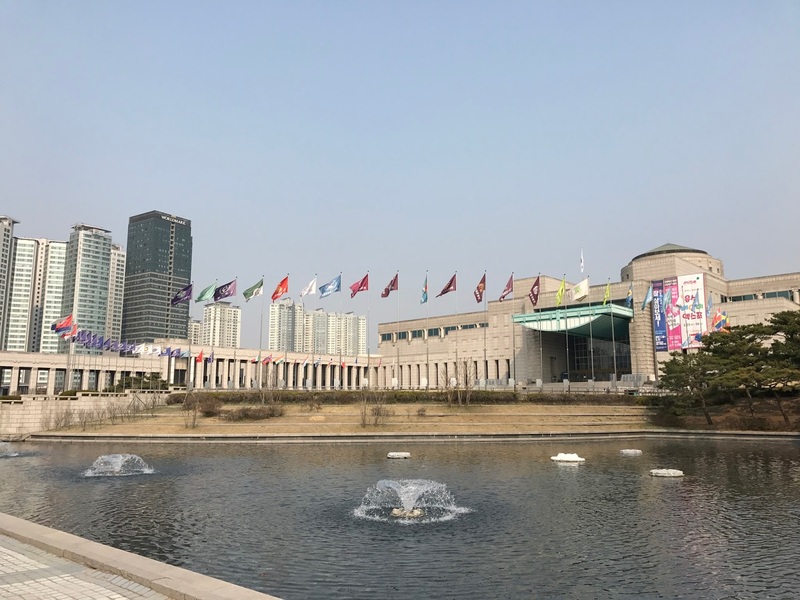 We then tried to find some more shopping, but our ability to find much in the way to traditional Korean crafts or goods was lacking. We did, however, enjoy wandering through an outdoor food market and some more modern shopping venues. Sunday was filled with more history as we visited the Korean War Memorial museum. 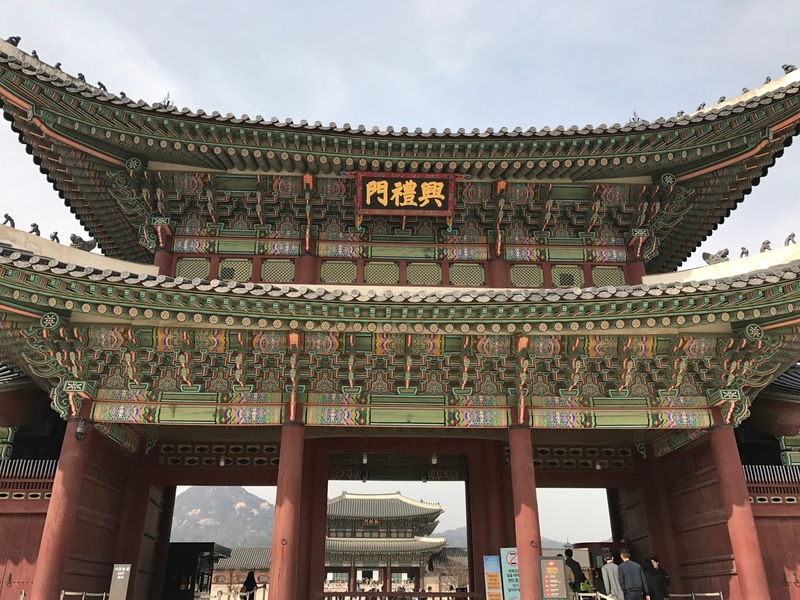 There was plenty of information about the Korean War, of course, but also a great deal about the overall history of Korea. 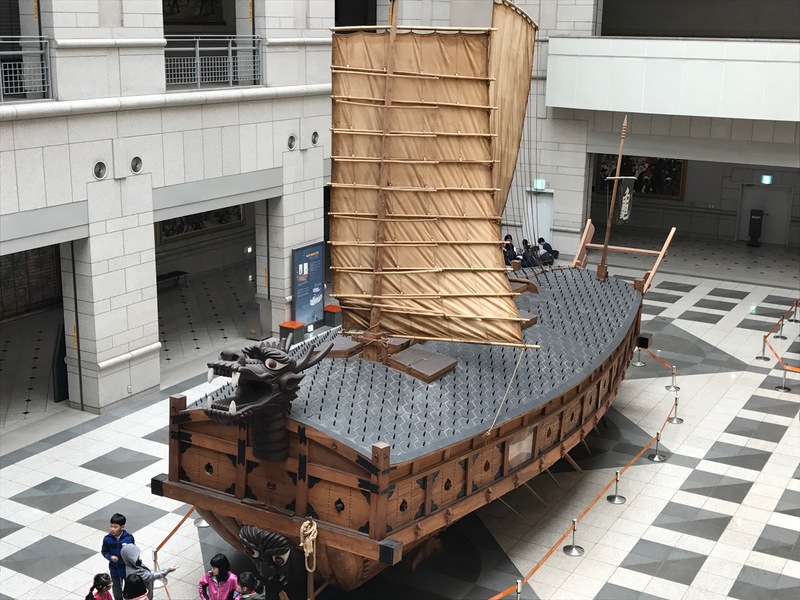 Since so much of the identity of Korea is wrapped up in the last century since the Japanese occupation and the Korean War, it was interesting to learn more about the previous centuries. Replica boat of one that had been shot up in a conflict, the red throughout marked bullet holes. 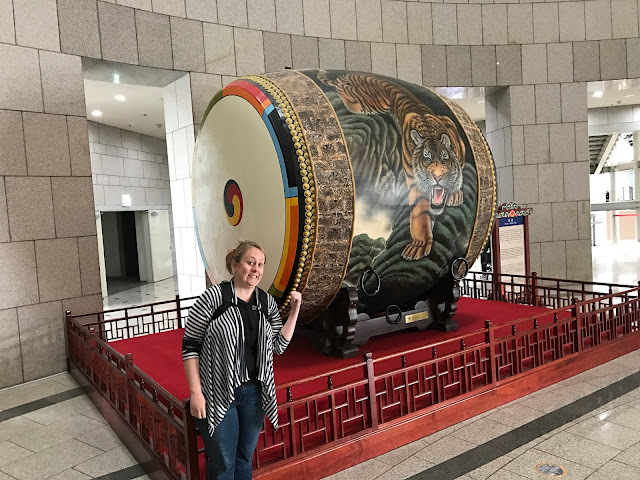 I wanted to play this drum! We did a little more wandering in search of lunch and culture, and were pleasantly surprised by the tacos we found. 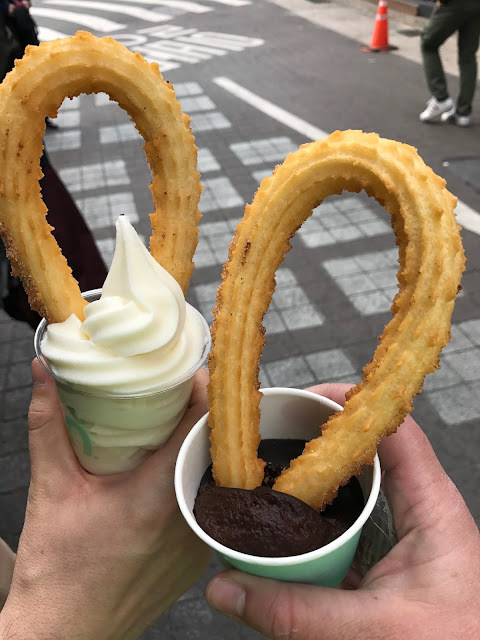 Also delighted by fresh churros in warm chocolate pudding and vanilla ice cream. Caitlyn, Blake, and I flew back to Japan on Sunday night (Jacob had a few more days of his assignment). 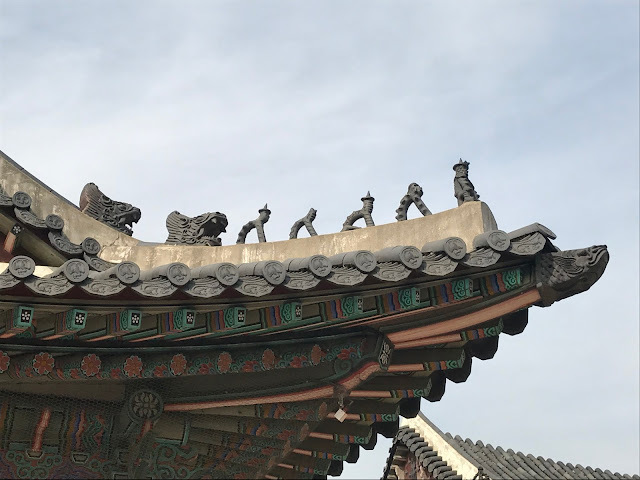 I had been feeling a little overwhelmed with all the new newness of Seoul and the inability to speak the language and was afraid I was experiencing the homesickness for America that so many other transplants to Japan had suggested I would feel. Fortunately, as soon as we arrived in Japan, which I have grown so accustomed to, the homesickness dissipated. It's strange to be calling Japan home now, but it is really is! 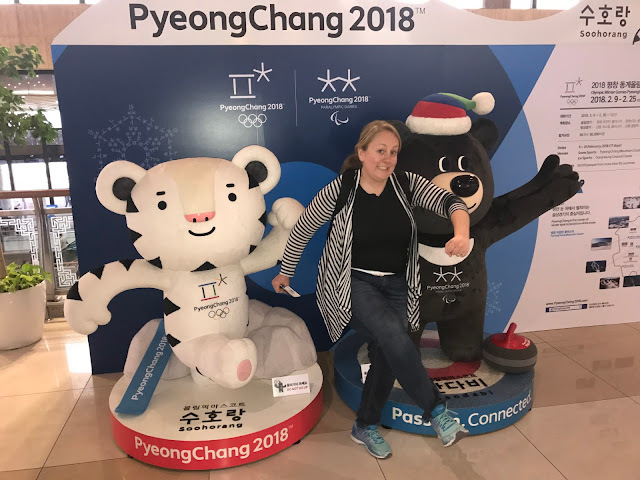 Maybe we will come back for the Olympics! 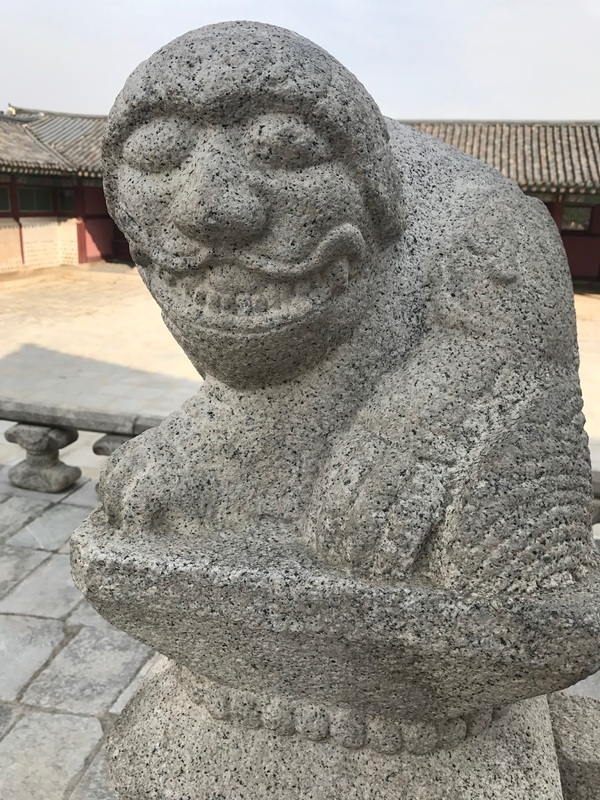 Such adventures you are having! That border is crazy. It's like a picture of hate and fear. I'll play that drum with you!